I got the green part right. A different take on tomato sauce. It’s been on the cool side the last few mornings. It reminds me of when I used to go back to university in September. The mornings were cool and the afternoons gloriously hot. We’re supposed to be in the “dog days of summer.” Those are the days from about mid July to mid August when summer temperature is supposed to be at its warmest. Lately, the mornings belie that. This is pretty much everything that goes in the sauce. Did you know the phrase “dog days” goes back to the Romans and Greeks? It was named for the time of summer when the “dog star” Sirius rose just before sunrise and was at its brightest. You can most certainly tell that nature is at least thinking about fall. I certainly hope we have lots of summer left, well through September, because we have a VAST crop of green tomatoes and other vegetables that still have to ripen. I’m sure the weather will cooperate. We’ve learned a lot of lessons so far this year from our small garden, all of which we will put into practice next spring. One lesson is that, with the right amount of soil amending, our yard loves tomatoes. We have planted many different varieties all to great success, so far. We have yellow pear, small cherry, pink, heirloom and Roma. Lots of Roma. It’s a little scary. They’re already the size of good ones at the grocery and are still green! Luckily Roma tomatoes have multiple uses, as well as the best choice for canning as tomato sauce. Our basil is cooperating now, too, so we will be putting up many jars using sweet, ripe tomatoes to see us through at least part of the winter. For a small garden we have had great success with the Roma, so I thought it wouldn’t hurt to steal six hard, green ones to try something new. I have made green tomato bread and butter pickles before, which were a revelation. I’ll probably be doing something similar with the unripe ones that aren’t ready by the time fall has set in. 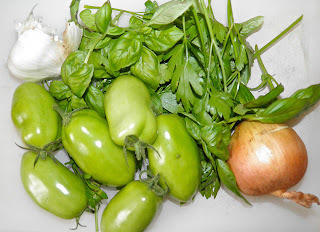 But I thought this time I would try them in a green tomato sauce for pasta. There are several recipes available but not many that make an actual “sauce.” Most use them as softened chunks. The wisdom was that when green they tasted “lemony.” I was interested to see if they were anything like a ripe tomatillo. I was not disappointed. You can cook them down quite easily into a clingy, chunky sauce. Since the sugars haven’t fully developed they do have a slight sour taste, reminiscent of citrus. To boost it I added lemon juice. The flavours were all nicely boosted by the addition of fresh basil and Italian parsley from the herb bed. It’s a good thing to grow your own fresh herbs. 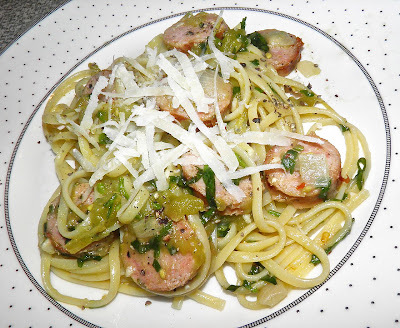 We had some pre-cooked luganega Italian sausage left over from the other night so I threw that in. You could also quite easily pair this with shrimp. If you’ve been growing your own tomatoes and are afraid of being inundated with green ones at the end of the season you should try this recipe. It’s an interesting, and delicious, variation on pasta sauce! Cook sausage and set aside. When cool. slice into bite sized pieces. Stem the tomatoes and rinse them off if in any doubt if pesticides have been used on them. Cut into medium-sized chunks. Set aside. Heat the oil in a saucepan. 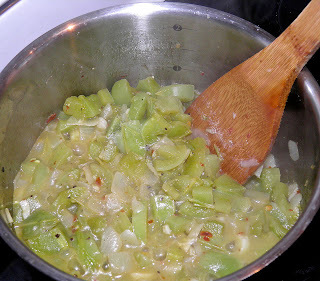 Add the onion and garlic and sauté until the onions begin to soften. Then add the tomato chunks and sauté until the soften slightly. Add the chilli, lemon, water, salt and pepper and bring to a boil. Let cook until the tomatoes are visibly breaking down – a few minutes. 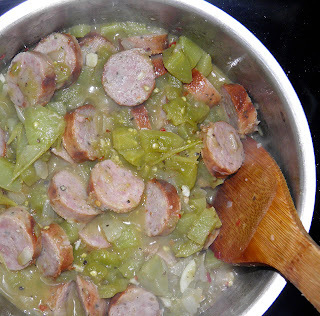 Then add the sausage slices, toss well, reduce the heat to medium low and cover. Let the sauce simmer while you cook the pasta (about 8-10 minutes). If using shrimp, throw them into the sauce only for the last 5 minutes of simmering time. Drain the pasta. If the sauce seems a little too thick, loosen it with a little pasta water. Toss the herbs with the sauce and then add the sauce to the pasta. Grate fresh parmesan cheese on top just before serving.